10 years in the making, my book, "The Ultimate Guide To Great Reggae", is finally out! 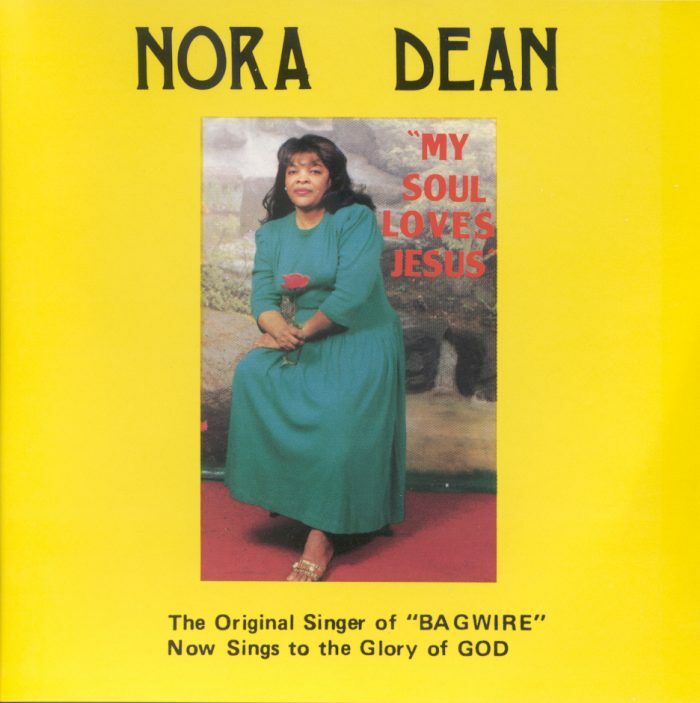 All new content on Nora Dean, plus the best of every style of reggae! Nora Dean moved to New York city in 1976 and married to man also of Jamaican origin. 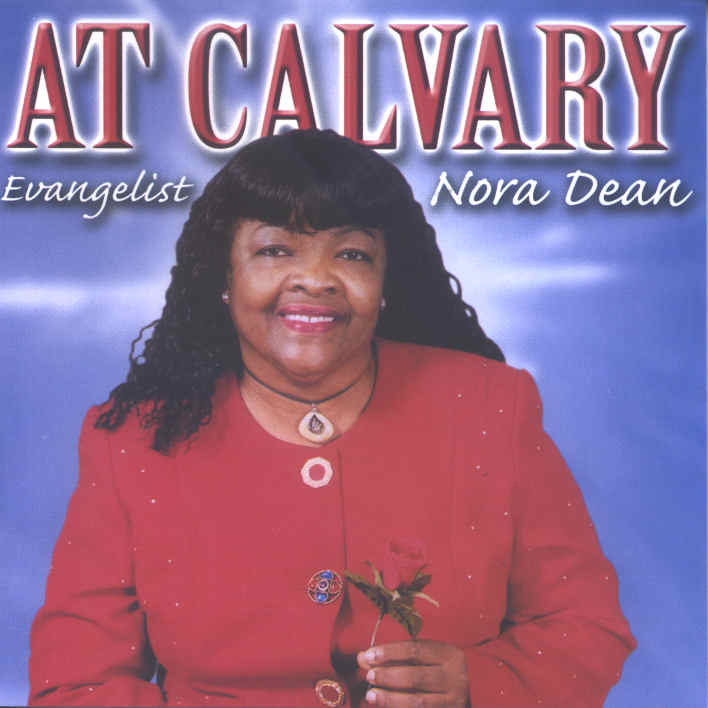 She joined the Times Square Church, where she sang in the choir. 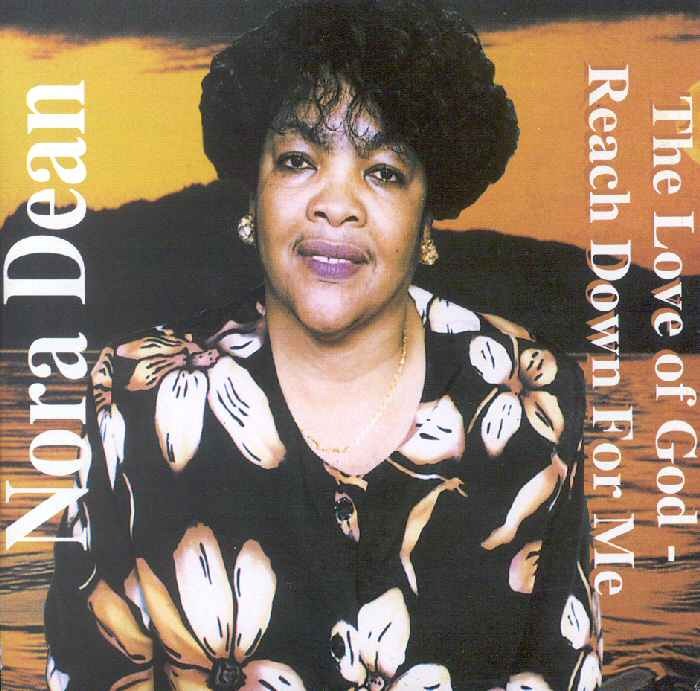 As she explains in the liner notes for "The Love of God", a serious and protracted illness lead her to realize the power of prayer, and she was born again in 1981. 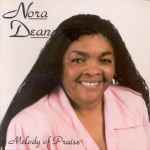 In 1996, Nora Dean returned to music and began a new career in gospel, recording at least five CDs. 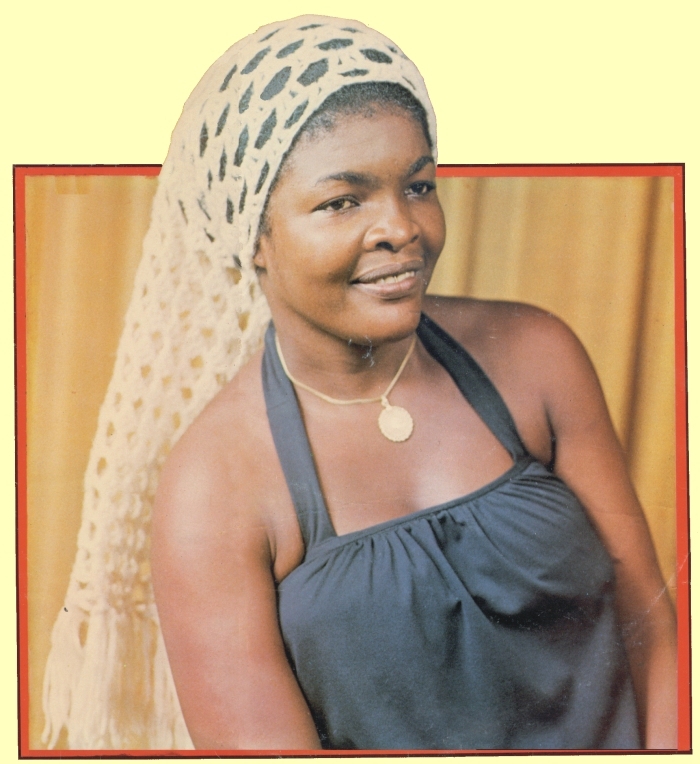 Fans of reggae, who are not fans of gospel are advised to continue reading. 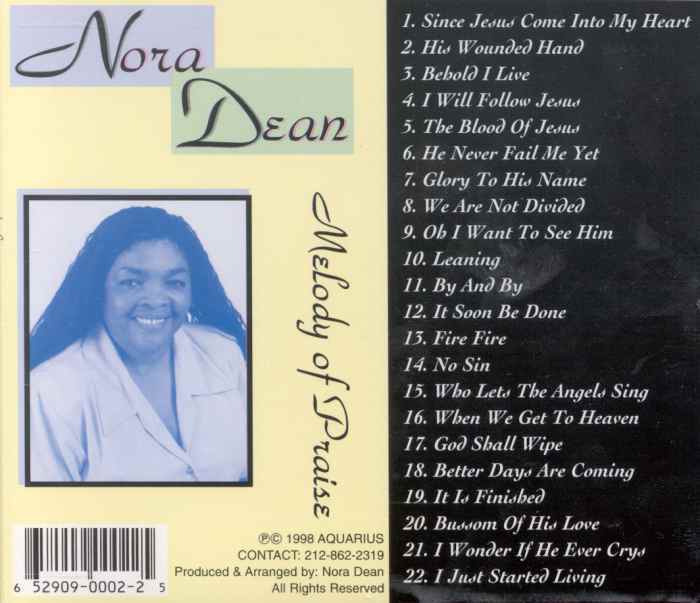 Each CD has a number of reggae-gospel tracks. 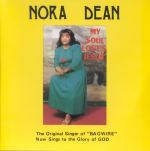 In these, though the lyrics are traditionally devotional, the music contains various aspects of reggae combined with gospel. 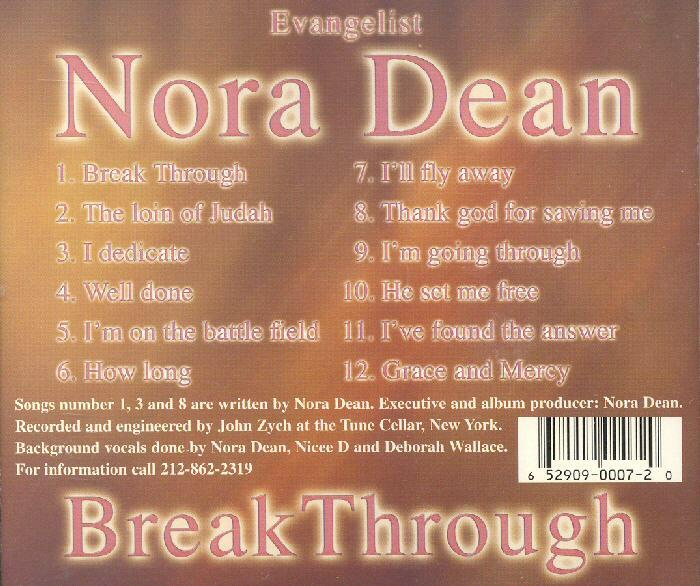 Of note is the fact that the CDs are produced and arranged by Nora and some contain self penned songs. Plus, her voice is as good as ever. Her singing is more mature, less quirky and is typically in a lower register than in her earlier music. All of these titles can be purchased at www.reggaecd.com. Nora currently lives in NYC with her family. She performs live at a gospel show with other former secular reggae stars, such as Hopeton Lewis and Owen Gray. 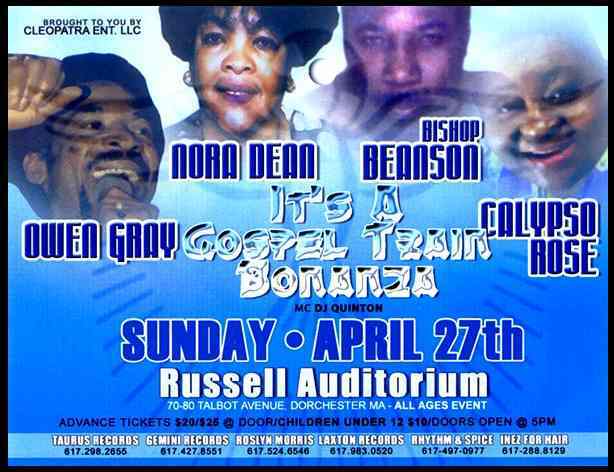 Above is an flyer for such a show in Boston on April 27, 2003. 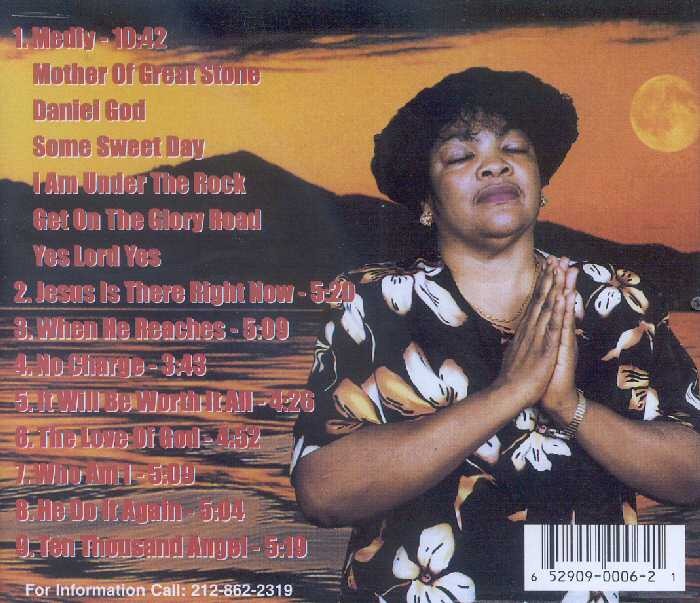 Thirteen gospel tracks, a few with reggae influence. 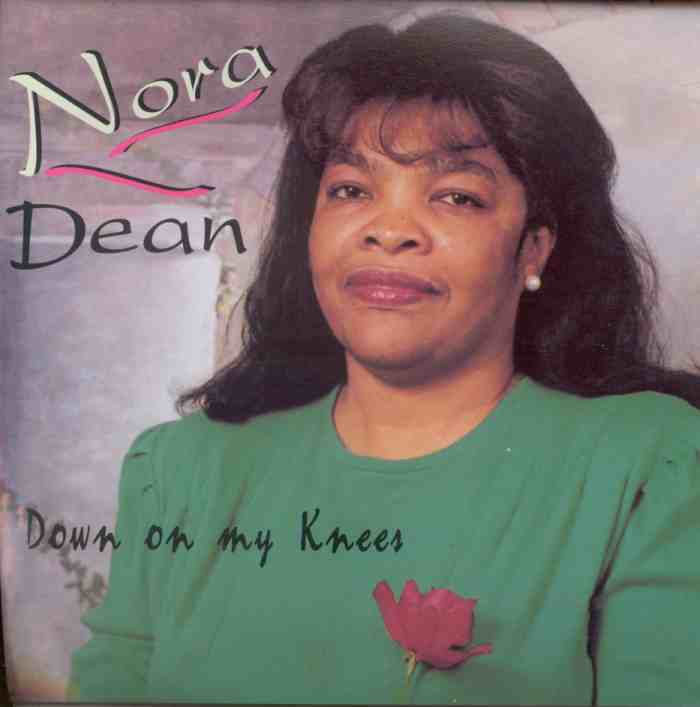 Four tracks were written by Nora. 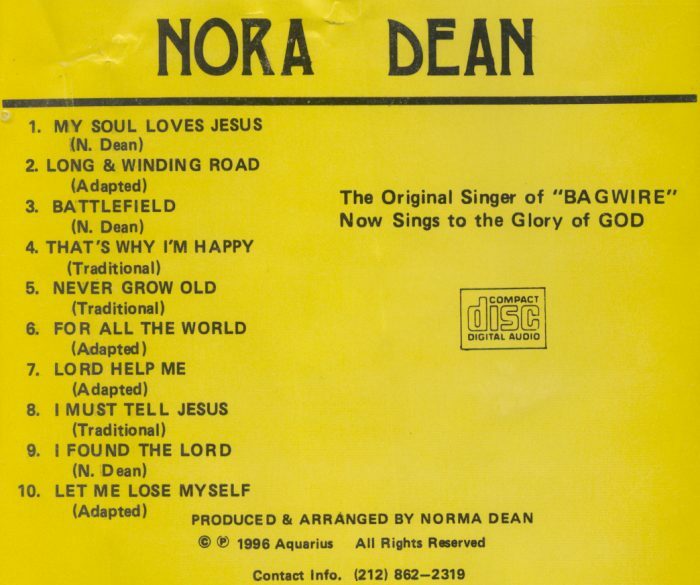 Includes a cover of "Rivers of Babylon". 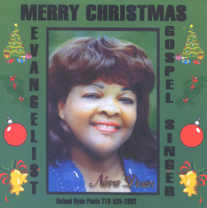 A CD of Christmas songs. The first track and the last (its version) is an older track, as described here. 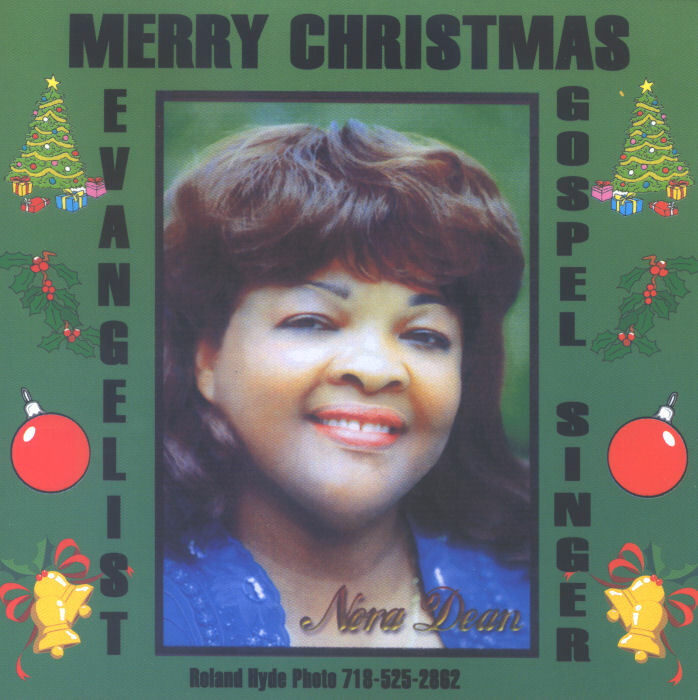 Seven gospel tracks, two Caribbean synth-pop tracks, and three reggae-gospel tracks. Three of the tracks are self penned. 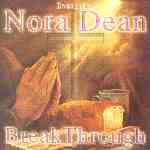 Two synth-pop reggae tracks, four reggae-gospel tracks, and six tracks with more traditional gospel arrangements. Three of the tracks are self penned. Begins with an 18 song medley of Caribbean sounding synth-pop. 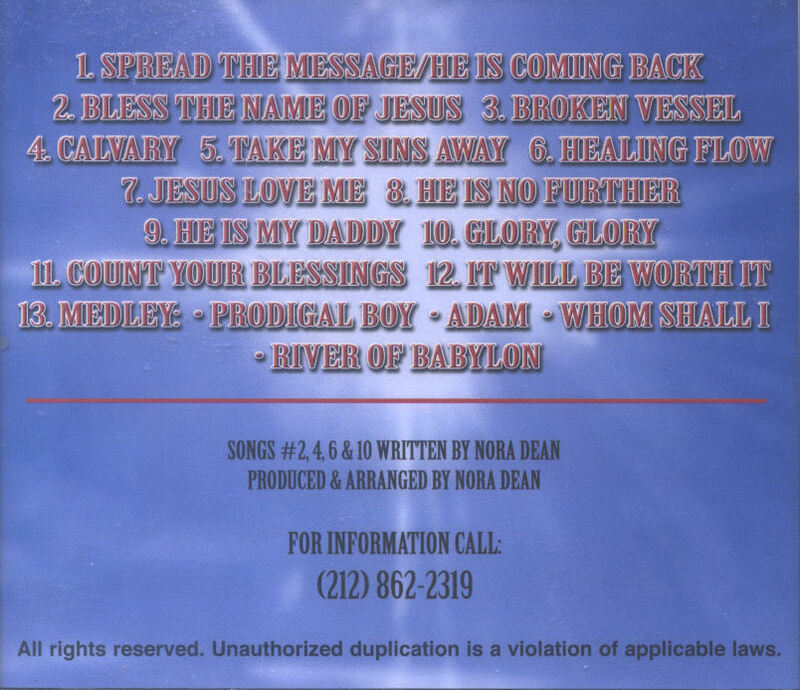 The same music is used for each song in the medley, creating a gospel ragga-light effect. 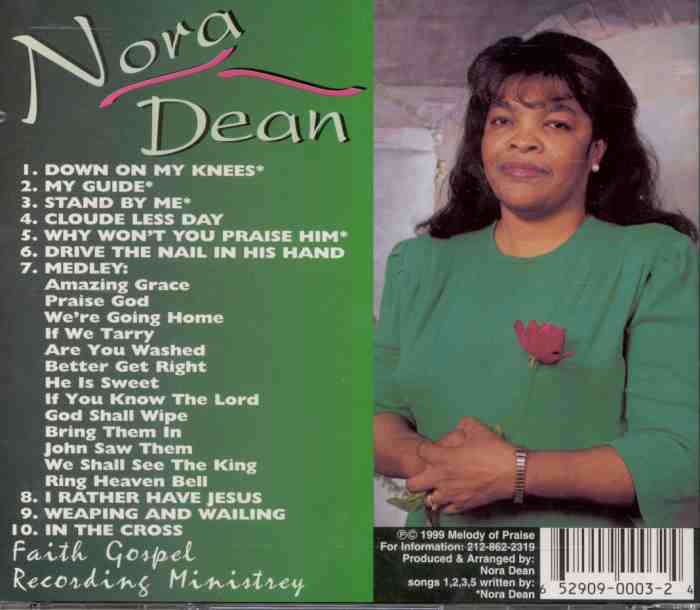 The CD closes with four reggae-gospel tracks that are influenced by American country music. 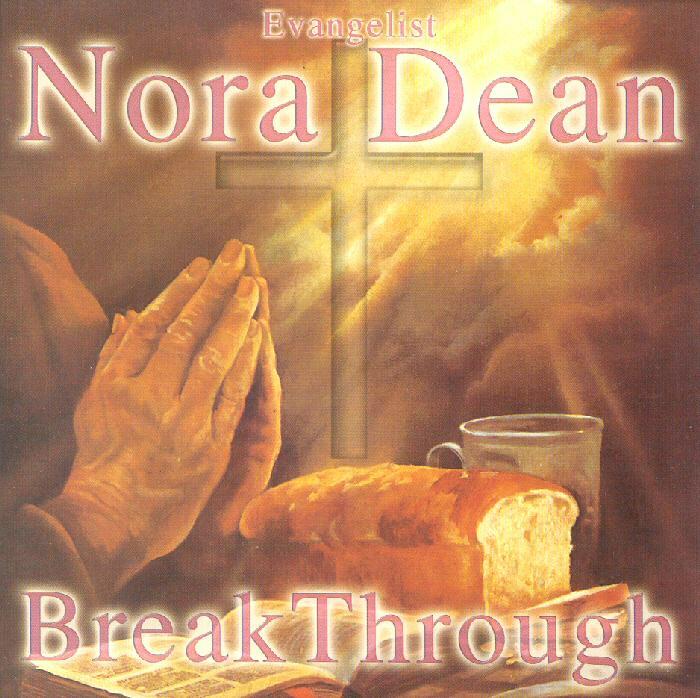 Three self penned songs. 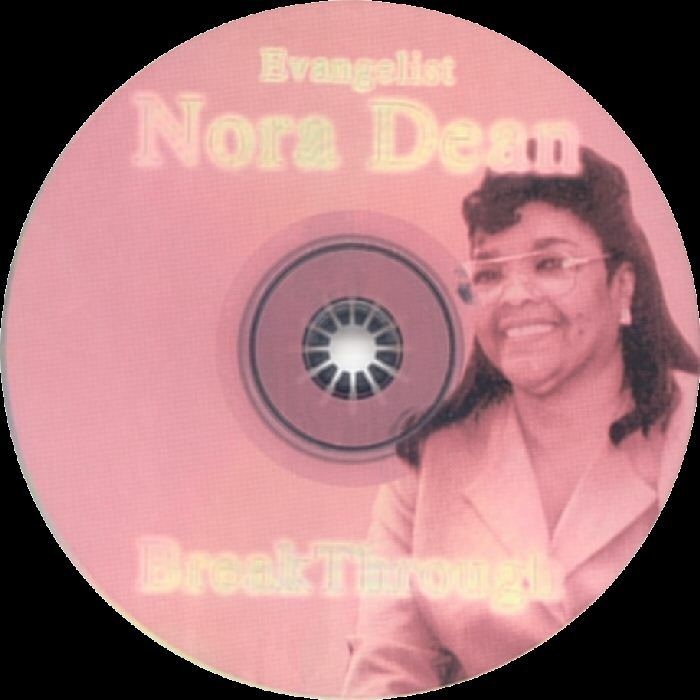 Two reggae-gospel tracks, six with gospel arrangements, plus two synth-reggae trracks, one of which is a medley of 15 songs. Four self penned tracks. 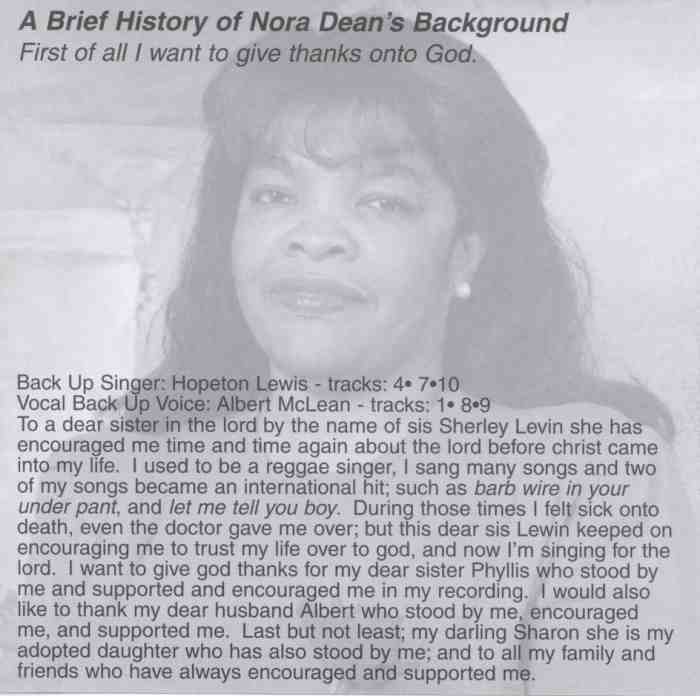 Guest backing vocals by Hopeton Lewis on three tracks. 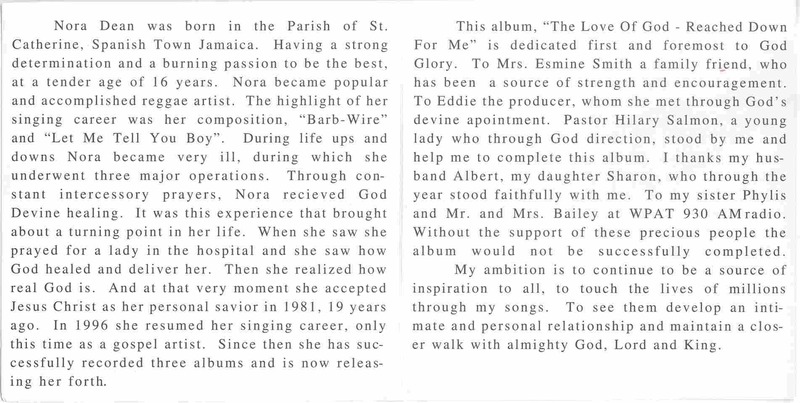 Begins with a 6 song Caribbean synth-pop medley, has another track in this vein, six gospel tracks and one reggae-gospel track. Three self penned tracks.